Discussion in 'Comic Books and Graphic Novels' started by jamarmiller, Feb 3, 2008. 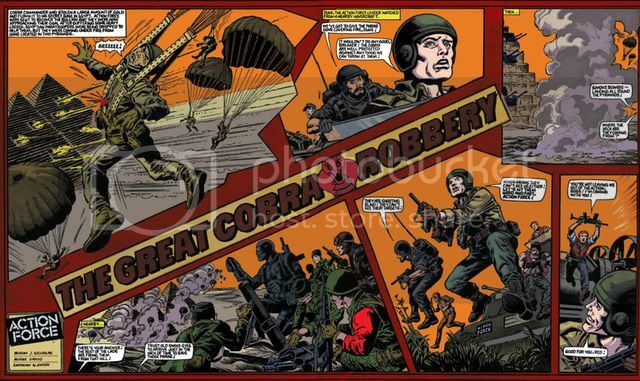 The FINAL CHAPTER OF The Great Cobra Robbery chapter 2 is now in full colour and online! Here is the 2 page preview ! With art and lettering by Vanyo and J.Nicholas respectively, BFTB is proud to embellish their creative vision with the colouring skills of Lars Johnson, aka Predabot on the first 5 pages ( double spread is counted as one, and myself Jamar Miller on the very last page ! Please please take the time to say thank you by sending him an e-mail and letting him know you enjoyed his amazing work on this final chapter.